Yes, now you can also be a proud Nest Preschool franchise owner. 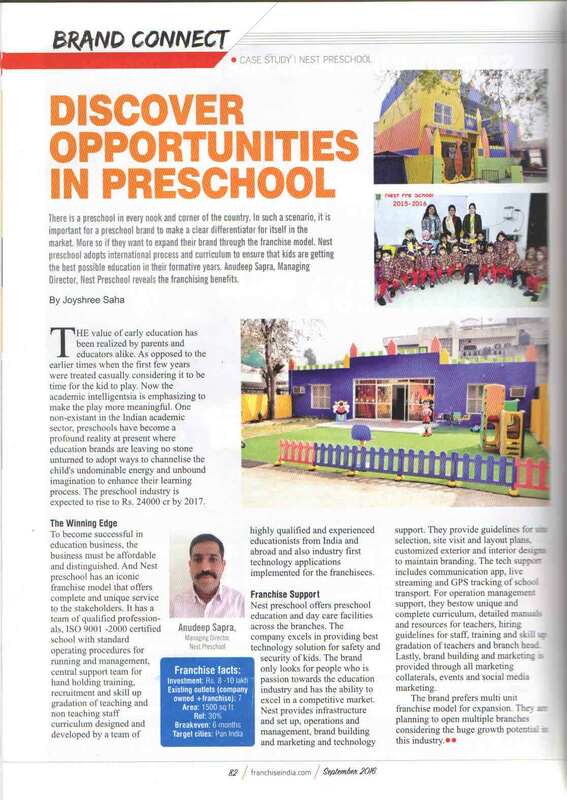 The Nest Group of Schools is now offering franchise options to people dedicated to the cause of education. If you are looking for an answer as to why you should be a part of our premium preschool and fastest growing chain, you should know about our unique international curriculum and that ours is an ISO: 9002 certified preschool. If you have a vision of starting an odyssey to enhance the vast potential of gen next, we offer you the winning formulae. To partner with India’s fastest growing chain, all you need passion for education. The Nest Preschool offers complete back up support by way of infrastructure and set up, operations, training and curriculum support, technology, brand building and marketing. You will receive a central support team for hand holding training, recruitment and skill up gradation of teaching and non-teaching staff, Our Curriculum that has been designed and developed by a team of highly qualified and experienced educationists from India and abroad. We will also provide technology applications implemented in all our branches like our communication app and the live streaming app. Another reason for you to partner with The Nest Group of Schools is that we believe in holistic child development and focus on four major aspects, creativity, thinking capabilities, independence and leadership qualities. Our curriculum specially lays stress on communication, application, life skills, habit formation and readiness for primary school. There is tremendous growth potential in the field of education. From 5600 crores revenue in the preschool sector, in 2011, it is expected to rise to 24000 crores by 2017. There has been a growth at CAGR of 23.2% from 2011 to 2017. The number of students enrolled in preschools is expected to rise by 16.4 crores by 2022. In 2014, The Nest Preschool was declared the best preschool and we are the proud recipient of the Shiksha Ratna award in 2015, for exemplary contribution in the field of education. If you are an entrepreneur, join hands with The Nest Group for a revolutionary tomorrow and establish your own preschool backed by expertise, experience and excellence. We have recently been featured in The Franchising Magazine. For further details visit our website www.nestgroupofschools.com. Partner with The Nest. Partner with Growth. Independence Day Celebration At Nest School!